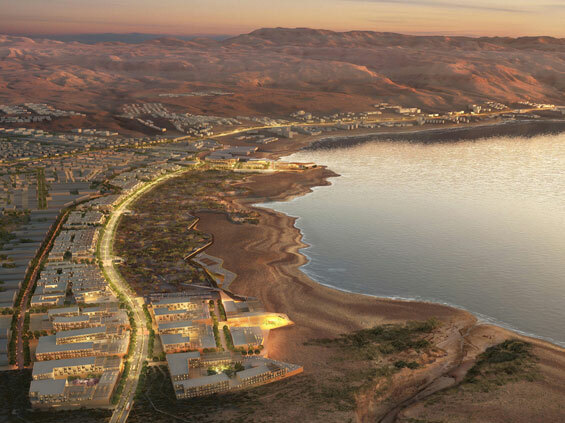 The Jordan Dead Sea Development Zone encompasses 40 square kilometers of land along the north and east coast of the Dead Sea. 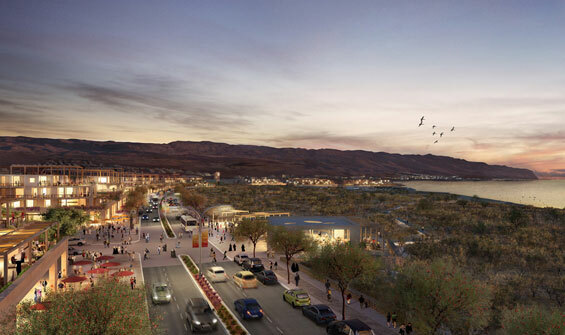 Over the past 15 years, the Kingdom of Jordan has focused on a balanced approach toward development and preservation in order to capitalize on increased tourism and to provide improvements to local existing communities. 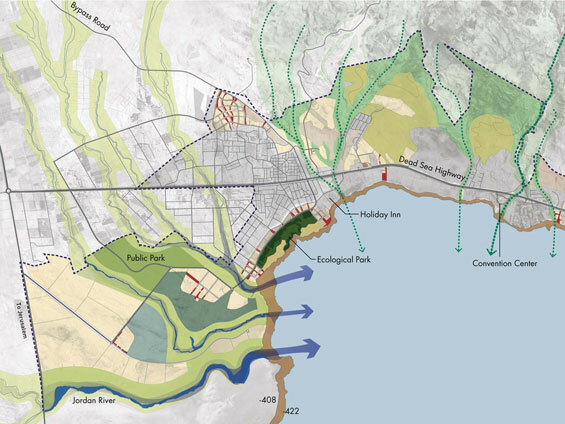 Sasaki was engaged to establish a detailed master plan as a sustainable framework for existing committed lands, future development parcels, infrastructure provisions, and natural resources protection. Sasaki’s plan offers a comprehensive and site-specific approach to the social, economic, and environmental sustainability issues facing this stunning setting. 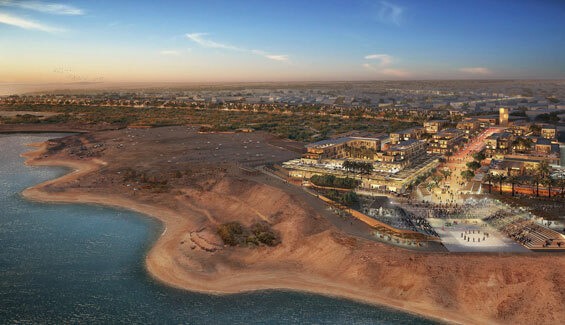 The plan lays out a vision and blueprint for fostering a dynamic, robust, and sustainable tourism-based economy at the Dead Sea that will become a source of pride and revenue for the Kingdom and set the highest standard for sustainable development and innovative urban design. 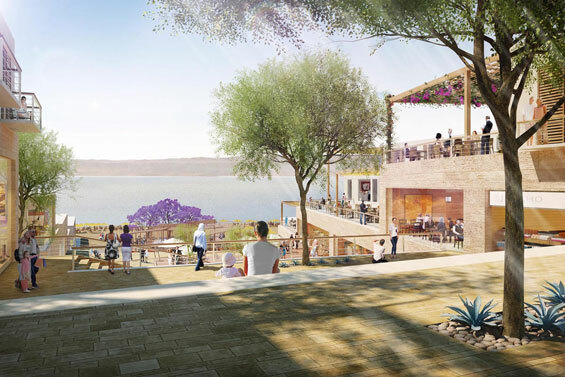 The plan establishes a balanced approach between development and conservation of the Dead Sea’s precious resources while supporting social infrastructure for nearby existing communities. 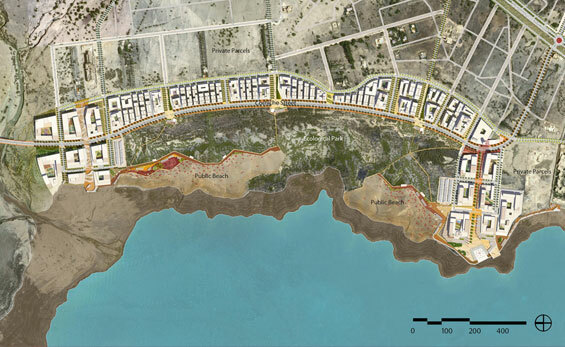 The first steps in framing the master plan included determining net usable land—identifying privately held land not within the purview of the development authority, and setting aside ecologically sensitive land for conservation. 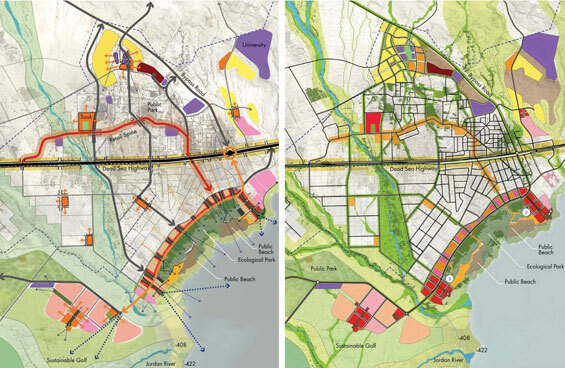 The resulting developable land inventory became the basis for strategic interventions and development proposals. 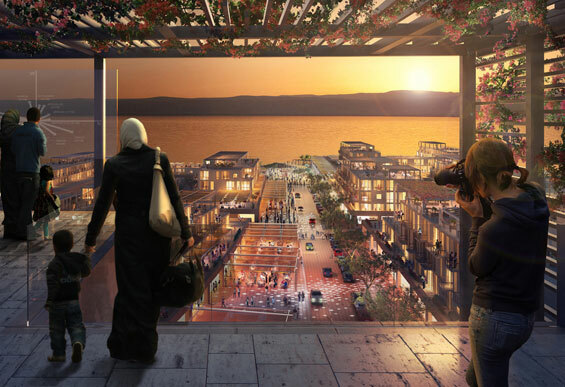 Comprehensive design guidelines, a detailed infrastructure report, and an extensive market study provide the Government of Jordan with tools to attract investment and steer future development in accordance with the plan. 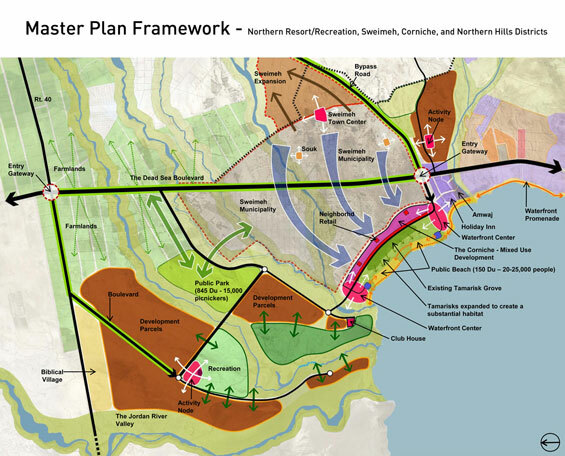 The master plan conceives of the project site as a series of districts, each with its own mixed use activity node. 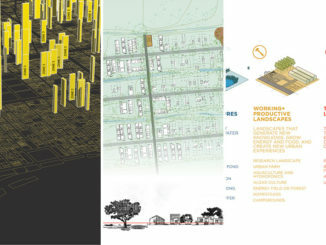 These nodes provide a critical mass of services including public water access, views, vibrant street life, and a range of development opportunities for all scales of investment from international developers to local businesses. A spectrum of sustainable infrastructure systems—an improved road network, public transportation, fresh water supply, waste water treatment, and utilities—stitch the districts together. 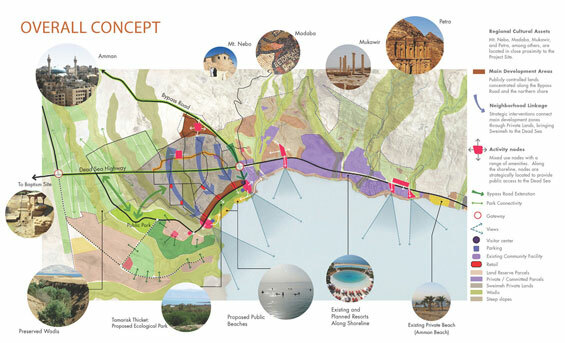 Sasaki also produced a Strategic Environmental Assessment, the first of its kind and scope in Jordan, for informing sustainability strategies incorporated in the plan at multiple scales. On the regional level, the scarcity of fresh water is addressed through a careful analysis of future supply and the introduction of measures to mitigate demand. A proposed centralized wastewater treatment plant will recycle precious water for irrigation while addressing basic public health and pollution problems caused by insufficient waste infrastructure. Public transportation reduces reliance on private vehicles. At a district level, streets and blocks are laid out to minimize solar heat gain on buildings. 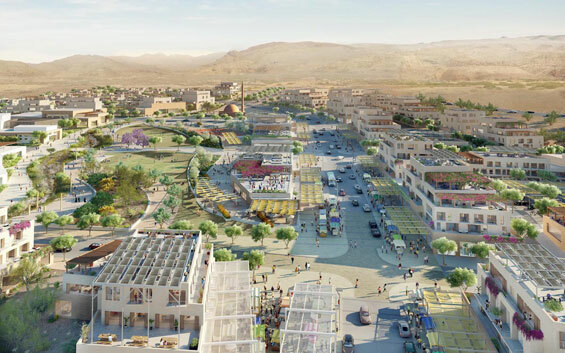 At the building level, guidelines informed by the Jordanian Green Building initiative promote sustainable strategies such as building shading, material selection, and xeric planting palettes that conserve resources while referencing regional design and enhancing a sense of place.